If you visit our homepage now you’ll see it says 813 service dashboards. That's over 700 more than this time last week. Up until now performance data was in two places - the Performance Platform and the Transactions Explorer. Over the past year we’ve been looking to integrate these two products and today we’ve brought them together. Moving everything to a single location is important for our users. 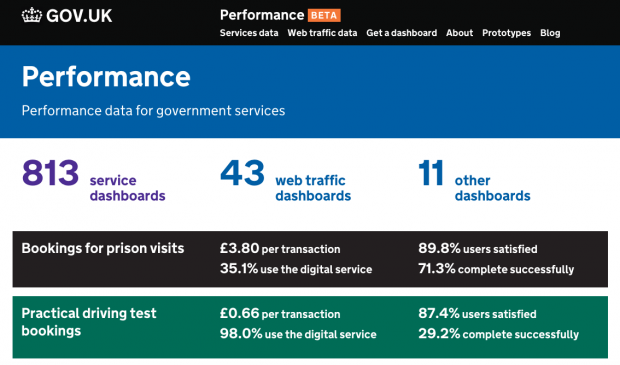 It means there’s now one place to find data on government services and that’s the Performance Platform. There’s no more navigating between different pages to find the figures you are after. Today’s changes are more than just a merger of two sets of data. The Transactions Explorer provided a base to understand all government services. The Performance Platform will build on this and combine data from different channels to become more useful to Service Managers, Government and users. Transactions Explorer data will still be collected and updated quarterly, but our aim is to get closer to real time information wherever possible. These changes mean we’re displaying more data than ever before. Previously low volume services did not have a dashboard of their own, but the shift to the Performance Platform means all available data can now be displayed for all services, regardless of size. To make things easier to find, we’ve updated our homepage with links to three categories of dashboards. You can now see ‘service dashboards’, ‘web traffic dashboards’ and ‘other dashboards’. The ‘other dashboards’ category is very broad right now - as we add more dashboards we’ll categorise them better. We hope you like the changes we’ve made. There’s plenty more to come. If you’ve any thoughts or suggestions please leave a comment below.